About three months ago I got a bloody awful cold. Over the following weeks this was followed by a cough, then a sinus infection, then a chest infection. The chest infection then apparently triggered some kind of latent propensity for asthma that I didn't know that I had. Fundamentally I've just spent a lot of the last three months coughing, wheezing and feeling like I've been hit by a truck, leaving me with the attention span of a labrador and all the energy of a damp flannel. This neat little thing measures how quickly you can blow out air. It's called a "peak flow meter". I managed 230 L/min, which is around half the ideal peak flow for a woman my height and age. As an aside, my first reaction on seeing this was to feel surprisingly offended - I hadn't realised just how much pride I took in my lung capacity, which is probably an attitude I picked up in wind orchestras over the years... However it was reassuring that I really did have some trouble with my lungs, and I wasn't just being an enormous wuss, even though being a wuss is usually a core part of my personality. 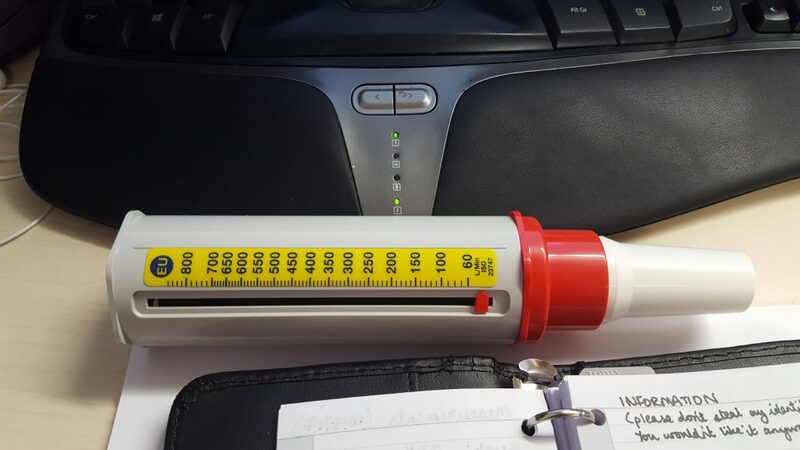 He gave me a peak flow meter of my very own and asked me to take a note of the recordings for a couple of weeks, and start taking a steroid inhaler after a couple of days. This almost made the whole asthma thing worth it (as a computational biologist, data is a precious commodity). So merrily I began to record my readings and put them together. The peak flow is on the Y axis, and the X axis is the date and time (each tick mark is the beginning of the day in question). The error bars are the standard error of mean for five readings at a time. As you can see, the readings are way above the 230 L/min I managed in the GP's office. I'm assuming that was a particularly bad afternoon because I'd been walking in the cold air. A healthy woman my size and age should have a reading somewhere in the range of 440-485 L/min, which I've been getting to on some evenings (yay!). Looking at this graph I can see... a whole lot of nothing. This is chaos. What information could I get out of this? Well, according to the GP, one of the classic signs of asthma is having a higher peak flow in the evening than in the morning. So let's take just the first and last reading from each day and plot them out. Here, the last reading is in blue and the first reading is in red. The morning readings are usually much lower than the evening readings, so that seems pretty cut and dried. I've put a little star over the days where the difference was statistically significant (p < 0.05, because as we know, 0.05 is a magic number). The GP gave me two inhalers: one brown steroid "preventer" inhaler, which stops the lungs from getting inflamed, and one blue ventolin "reliever" inhaler, which stops the airways from spasming. Another classic sign of asthma is the readings improving after taking the blue ventolin inhaler. The data that's needed to work this out is a reading right before taking the ventolin, and one reading a sensible amount of time afterwards (half an hour seems about right). I only really gave this any thought today, so I'll have to collect more data in order to make any inferences. I know that my lungs subjectively feel a lot easier after taking ventolin. These facts taken together make it sound pretty conclusively like asthma. It feels good to have a fairly definite diagnosis, because at least we know how to go about treating it. The readings seem to generally be improving over time but there's so much variation that it's difficult to see a strong trend. The readings don't quite match up with how I've been feeling, either. Since Monday 16th I've been particularly wheezy and exhausted and on Wednesday 18th I honestly thought I might be dying, but the results don't make a noticeable downward swing. That said, I always do feel better in the evenings than in the morning, so that matches. I'm assuming I felt so much worse on Monday because of that big ol' dust cloud, because I can't think of another trigger. I took two puffs from the blue inhaler at once one day last week and WOW was that horrible. Ventolin, it turns out, acts much like adrenaline in the body, leading to a racing heart and hands so shaky I couldn't even hold a restorative cup of tea. I briefly considered taking a beta-blocker to combat the side-effects but I feel as though taking a drug and then immediately taking the opposite drug is probably a bad idea? A little like swallowing a spider to catch a fly. Anyway, I won't be doing that again. The GP gave me a "spacer", which is a clear tube to put between my mouth and the inhaler, but I can't stop referring to it as "the bong" which does not make me sound as though I'm taking this whole thing seriously. This asthma is likely to get better once the steroid inhaler does its job so I can't reasonably describe myself as chronically ill, but the Spoon Theory of dealing with reduced energy levels has helped a lot with prioritising tasks. In that vein, I've been concentrating on doing the urgent and/or important tasks when I have the capability. Something that helps with this is a spreadsheet I made which is called "how long until things happen" and automatically calculates the number of weeks and days until various events. You can make a copy of this one and use it for yourself. I'm surprised at how much I've missed exercising. I usually walk for about an hour every week day and do a fair amount of rowing and yoga on top of that. I joined an all-female powerlifting club before I got ill and I'd really like to get back to that as well. I last went to the gym about 2 months ago and I've been taking the bus to work when I'm capable of going in because the walk is absolute death. I have done a small amount of yoga when I've had the energy which is helping with all the odd aches and pains I get when I have several inactive days in a row. Considering that I've basically been ill near-continuously for over 3 months, I'm surprised at how much I've gotten done. Heck yeah. That said, I'm glad I have 4 different sets of pyjamas because I've spent a spectacular amount of time wearing them lately. I treated myself to this pair of slippers a while ago and they are so warm and fuzzy, definitely worth the money. I got this blanket for Christmas and it has also been a great comfort. I gathered as many pillows as I could find and made myself what I'm going to call my Pillow Throne in bed so that I can sleep propped up, which helps with the breathing at night. Asthmatic pals, do comment below with any of your top tips. I mentioned in my last post that I've made a little macro for Microsoft Excel 2003 (I think it works in earlier versions, 2007 and OpenOffice Calc, but haven't tested extensively), which helps collate data from lab instruments which spit out individual tab/comma separated text files. An example of its use: I was taking readings from six different samples at intervals of a few hours. The machine (a fluorimeter) spits out text files with all the information it's gathered, from which I only needed one line (one particular wavelength I was interested in). This macro picks up just the line you need from the file. You need to know which row you are looking for out of the text file. The easiest way to do this is to import it into Excel/Calc and scroll down until you find it, then note the number. If the text file has any extension other than .txt you need to edit the macro a little. Follow the instructions below for getting the spreadsheet, then press Alt + F11, open up the macro using the bar on the left and search for ".txt" in the code. Replace ".txt" with the file extension and save. The simple option for using it is to download this Excel spreadsheet, and open it up. (you may have to enable macros) then press Ctrl+Shift+W. Enter the appropriate information into the pop-up box. Then save the resulting file. WARNING: The macro will fall over if your naming of files isn't consistent. To have it at your disposal all the time, save the file in the "XLStart" folder. If you installed Microsoft Office in the default location, you'll find "XLStart" under "C:\Program Files\Microsoft Office\Office" + whatever version of Office you have. Then press Window > Hide. Then whenever you open Excel and press Ctrl+Shift+W, the macro will run. If you want just the macro itself, download this Visual Basic file. I hope this ends up being useful to someone - it sure saved me a lot of faffing. If I've been unclear please ask for clarification.